The cost of starting a business in Italy is relatively high as compared with other EU member states. One reason is the cost of notarization, which is mandatory under the Italian law. In order to reduce this cost, in 2012 a new type of limited liability company was created—the simplified limited liability company—for which notarization should be provided free-of-charge. In this paper we explore the reasons behind the requirement of notarization and review the evidence from a few cases where notarization was made optional. Subsequently, we describe the results of an ad hoc experiment in order to evaluate the design of the policy. We performed a randomized control trial involving almost 350 notaries in Rome, Italy. We find that the majority of the notaries in our sample do not fulfill the obligation by asking a greater-than-zero fee, therefore suggesting the policy is not fully effective. 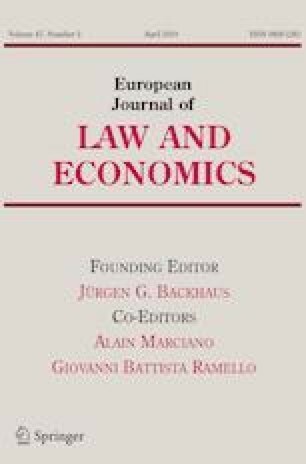 We conclude that obliging notaries to perform specific tasks below-costs (or even free-of-charge) may not be an effective policy, leading to suboptimal results. We would like to thank five anonymous referee, Carlo Amenta, Luigi Biagini, Raffaello Bronzini, Sandro Brusco, Domenico Chiofalo, Luca Enriques, Silvia Giacomelli, Cesare Licini, Giovanni Liotta, Alfredo Macchiati, Enrico Martini, Thomas Manfredi, Simone Mezzacapo, Silvio Schinaia, Roberta Serafini and participants to the “Notaries and efficiency: a cost or a value?” seminar, Milan, Jan. 12th, 2018. The views expressed in the article are those of the authors. Responsibility for the information and views set out lies entirely with them.